Carl Froch is a retired British boxer. He has held both the IBF and WBA super-middleweight titles. He is currently a boxing commentator on Sky Sports. Who is Carl Froch, how old is he, when is his birthday, how tall is he, where is he from and what is his background? Carl Froch is a British boxer who has won four super-middleweight world titles. He was born in Nottingham, England on July 2 1977. He is 41 years old and 1.85 metres tall. He grew up on a council estate and his father served time in prison before Carl was born. He aspired to be a professional footballer for his local team Nottingham Forest but his father took him to the boxing gym a couple of times a week from the age of eight. By 1999, Froch was fighting and winning titles as an amateur boxer in the middleweight division. This included two ABA middleweight titles as well as winning bronze in 2001 at the World Amateur Boxing Championships. He turned professional in 2002. He has a brother Lee who is also a professional boxer. Why is Carl Froch famous and what is his occupation? Carl ‘Cobra’ Froch is a retired British boxer. He works as a boxing commentator for Sky Sports. He was awarded an MBE by the Queen for services to sport in 2015. What is Carl Froch’s net worth? Carl Froch has a net worth of $35million according to networthupdates.net. How much does Carl Froch earn? According to Froch’s autobiography, when he fought Groves in November 2013 he received over $5million and on 31 March 2014 when the two fighters had a much-anticipated rematch he won $13million. How much does Carl Froch weigh, what weight division is he? At the weigh-in for his 2014 fight with Groves, Froch weighed in at 167 pounds, almost 76kg. He fought in the super-middleweight category. 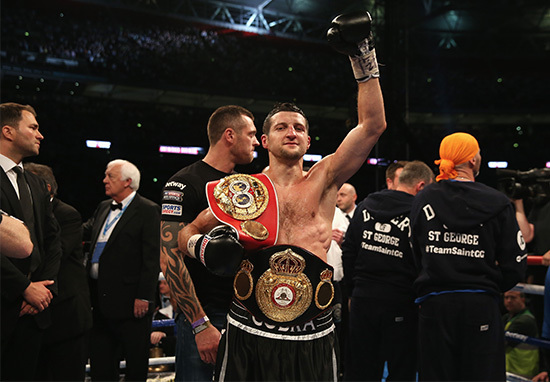 Has Carl Froch retired, when and why did he retire? Carl Froch announced his retirement from boxing in July 2015 and took up a position as a Sky Sports boxing commentator. After his last fight with George Groves in 2014, but before he announced his retirement, Froch also appeared as a contestant on the BBC One gymnastics competition Tumble. In 2017, Froch hinted the he would come out of retirement and return to the ring to face Mikkel Kessler but nothing has been formally announced. Does Carl Froch have any children? Carl Froch has three children with fiancée Rachael Cordingley, Rocco born in 2010, Natalia born in 2013 and Penelope born in 2015.
Who has Carl Froch fought in boxing matches, how many fights has he won, what are his most famous fights? Carl Froch has had 35 professional fights, winning 33 and losing two. In 2008 he fought Canadian Jean Pascal over 12 rounds to win the WBC super-middleweight title. After beating Americans Jermaine Taylor and Andre Durrell to retain his title, he lost on points to Danish fighter Mikkel Kessler in 2010. He regained the title later that year after beating Arthur Abraham. He lost the title again on points to Andre Ward in late 2011. After this defeat Froch came back strongly to win the IBF super-middleweight title against Lucien Bute at the end of 2011. He went on to defend this title against Mack in 2012 and Kessler in 2013 before meeting George Groves for the first time in 2013. Froch was floored early on in this fight but fought back to win a TKO in round 9. This was a controversial victory as some commentators felt the referee stopped the fight prematurely. 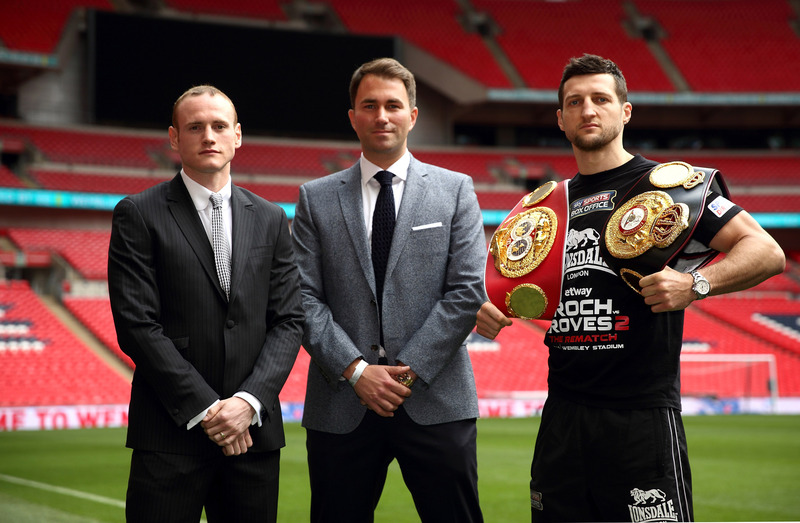 As a result the IBF ordered Froch to schedule a rematch with Groves. This fight took place on May 31 2014. This was a close fight until Froch knocked Groves out in the eighth round. The Ring magazine named this the Knockout of the Year for 2014. This was Froch’s final fight before he retired in 2015. Is Carl Froch married, who has he dated in the past, was he married? 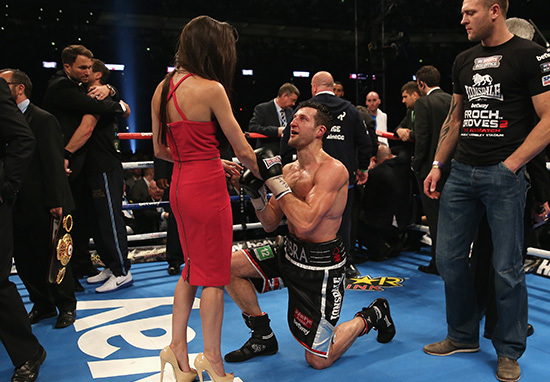 Carl Froch is engaged to Rachael Cordingley, a British glamour model. The couple have three children.